Deck of 52 cards and alcoholic beverage for each person. A table is preferred but, the ground is sufficient. The object of the game is to “F*@% the Dealer” by guessing cards correctly, making the dealer drink. Everyone sit in a circle; the dealer holds a shuffled deck of cards and looks at the card on top careful not to let anyone else see. He/she then asks the player to their left what they think the card is (the number of the card only, not the suit). If they guess right on the first try then the dealer takes ten drinks. 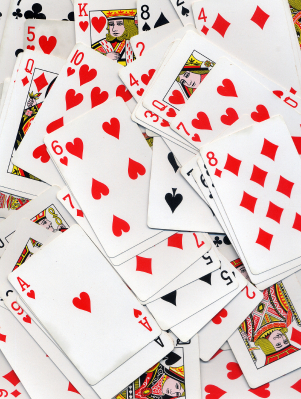 If not then the dealer tells the player if the card if higher or lower than their guess. If they guess right on the second try then the dealer only drinks 5 drinks. If they guess wrong again then the player has to drink the difference between the card and their last guess (say the card is a 10 but the player says 7, they only drink 3 drinks). Now the card is shown and placed in the middle faced up. Leave room to line the cards up in order as the game progresses. The dealer then repeats the same guessing process with the next player. The goal of the dealer is to have three players in a row guess the card wrong so they can pass the deck to the player to their left, who becomes the dealer and starts with the next player up to guess and so on. The person who ends the deck as the dealer must take a shot! Rules: The next dealer is always the person to the left of the current dealer. The next player is always the person to the left of the current player. This entry was posted in Games, Miscellaneous, Party and tagged alcohol, cocktail, drinks, easy, friends, fun, games. Bookmark the permalink.